The cross burned outside of Stone’s old home. 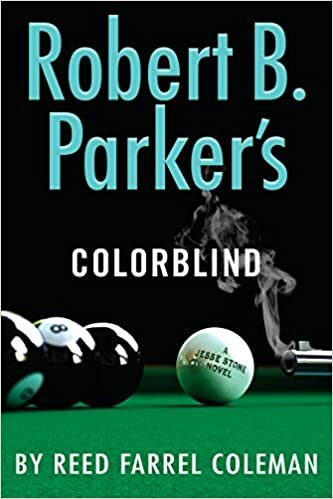 Reed Farrel Coleman’s latest addition to the Jesse Stone mythos is Robert B. Parker’s Colorblind (2018). For the uninitiated Jesse Stone is the Chief of Paradise, Mass. and was a former homicide cop in LA, via blown out shoulder so he couldn’t play in the big league’s of baseball (aside from strong novels, it is a good movie series starring Tom Selleck). Stone was hired as chief not for his expertise, but the perceived ability to control a divorced-co-dependent-alcoholic cop by a corrupt town council. As each story has proven there are more layers to this character than the proverbial onion. Colorblind opens 2 months after Stone returns to Paradise from rehab. He enters a life not struggling not to simply not drink, but to actually live sober. An astute difference of circumstance and struggle that Coleman show’s in the internal struggle where the ritual of alcohol was so central to Stone’s process of crime solving, but also self destruction. Through subtle writing you see the struggle within and without for the entomology that is addiction, but trying to understand what redemption and healing can look like. Much like Paradise being a town on the crux of change with the influx of new, so is Stone a living embodiment of this change. In ripped from life fashion, the S.S. comes to town to spark a regression back to the horrible old days of hate and never was days. But are they more than just pamphlets as interracial couples are targetted? And the “first” (hard for those who love the movies/books who always saw officer Crane as African American) African American Officer, Alisha, is hired, and struggles through what happens when the Nazi’s come to town and show hate is more cult like than any religion. As always there is more along the surface, as an enigma comes to town in the midst of the struggle of light and darkness. Suit is still coply and following his intuition. Crane is motherly and strong. Healy is the dour-acidic old cop. And quite possibly as normal Stone is in over his head, but unwilling to allow legal-illegal to be the only benchmark for justice when wrong has overcome right. A good read for the mystery. A better read for the conversation on the resurgence of Nazism in North America and what it says about the state of our soul.